Denver, CO – October 5th, 2018 – The producers of the Outspoken: Women in Triathlon Summit are proud to announce a partnership with Women For Tri® , an initiative of the IRONMAN Foundation® launched by IRONMAN® to bring more women into the sport of triathlon. 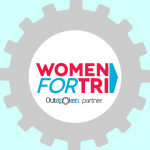 Women For Tri will be hosting a lunch at the Summit and will provide a full-ride scholarship to a selected applicant. IRONMAN Vice President of World Championship Events Diana Bertsch will also be presenting at the Summit. IRONMAN Foundation Acting Executive Director Sarah Hartmann will take the lead at the Women For Tri Luncheon on Saturday, December 1st by introducing keynote speaker Congresswoman Kyrsten Sinema. In addition to leading the IRONMAN Foundation (IMF), Hartmann works to create impact through Team IMF, IMF in Service, and Women For Tri. Arizona Representative and Senate Candidate Kyrsten Sinema is a dedicated runner, triathlete, and IRONMAN competitor. Sinema, whose family struggled to make ends meet and was even homeless for a time, has overcome adversity and obstacles. This has motivated her to serve and give back to her communities, which includes her service as chair of the Women For Tri Committee of Advisors. Diana Bertsch first got involved with the iconic IRONMAN World Championship Race in Kailua-Kona when she signed up to be a volunteer more than 20 years ago. Bertsch has been involved in the race ever since, racing it herself in 1995 and rising in the ranks to Race Director in 2003. Bertsch now oversees both the IRONMAN® World Championship and IRONMAN® 70.3® World Championship events, which serves thousands of triathletes.